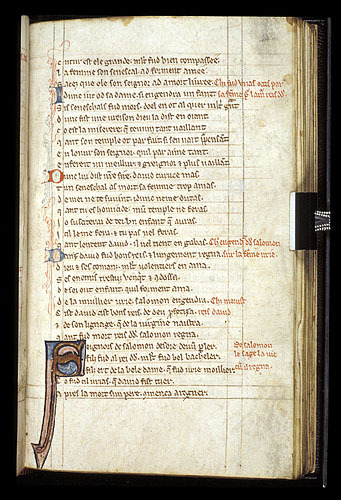 Recitation of Herman de Valenciennes, Li Romanz de Dieu et de sa mere, 1189-95, vv. 398-466, read by Alice Colby-Hall, Emerita, Cornell University. The equivalent line numbers in the edition by Ina Spiele, Li Romanz de Dieu et de sa Mere d’Herman de Valenciennes (Leiden: Presses universitaires, 1975) are vv. 398-466. The edition used here is from Vernacular Literary Theory From the French of Medieval England: Texts and Translations, c. 1120-1450, ed. J. Wogan-Browne, T. Fenster and D. Russell (Boydell and Brewer, 2016), where the text is also translated.